Wildfires have always been a threat to populated, mountainous communities in Colorado, however, for the past 80 years forest managers have aggressively undertaken wildland fire suppression, resulting in unnaturally high fuel loading within the forest and prairies ecosystems. These factors, combined with the unprecedented development within the "Wildland/Urban Interface" areas have significantly increased the threat of serious property damage and personal injury, especially along the densely populated "Front Range Corridor". As this Urban Interface continues to expand, the potential for a catastrophic event will expand proportionally. As stated by USDA Forest Service, Soil Scientist, Tim Sullivan, "It isn't a matter of if wildfires inflict catastrophic damage to people and property along the front range of Colorado - the question is, when will it happen?" On May 18, 1996, just such an event occurred. A human induced wildfire burned nearly 12,000 acres of the Pike National Forest and surrounding private lands, destroying 10 dwellings and costing millions in suppression costs and property damage. 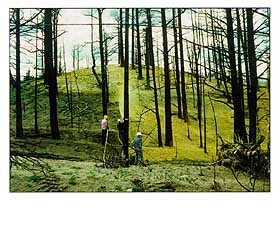 Less than two months later on July 12, 1996, a high intensity thunder storm dumped approximately 2.5 inches of rain on the fire ravaged terrain causing severe flooding, which resulted in the washout of Jefferson County Highway 126 and the destruction of the City of Buffalo Creek's potable water and telephone facilities. The storm also resulted in the deposition of hundreds of thousands of tons of sediment into Strontia Springs Reservoir (15 year sediment load), the loss of miles of pristine riparian habitat along Buffalo Creek and Spring Creek drainage's and the deaths of 2 Buffalo Creek residents. Most residents of Buffalo Creek had fire insurance, however, nearly no one was insured against the impact of flooding. Post fire storm flooding and related impacts are the second disaster that challenges federal, state and local governments. This challenge is composed of organizing and allocating human and financial resources to develop post-fire disaster planning and implementation programs in a timely and cost effective manner. This article presents information on post-fire/flood hazard assessment and mitigation planning conducted by the USDA Forest Service and the community of Buffalo Creek. Woodward-Clyde and REVEG Environmental Consulting, Inc. donated professional services to aid in the restoration and mitigation efforts following the fire/flood disaster of 1996. Vegetation is the key factor that limits the impact of erosion in most areas. Plants provide cover that intercepts and reduces rainfall impact and slows wind velocities, the primary mechanics for soil erosion. Vegetation also increases water infiltration into the soil, reduces runoff velocities, filters sediment and contaminants and provides structure (roots) to hold the soil in place. After fires, soils are no longer protected by vegetation cover and are subject to accelerated erosion rates. Turbulent air can blow slopes clean of loose soil particles, depositing material in down slope areas and stream channels for later movement by the forces of flowing water. The erosive impact of water on bare post-fire soils is accelerated by even moderate precipitation events. The development of rills and gullies are evident on steep slopes and within drainage channels. Infiltration rates decrease on bare slopes causing increased runoff and accelerated sediment carrying capacity. The resulting sediment and debris movement into stream channels causes clogging within the channels and mud and debris flows, which scour steeper channel segments and encourage significant deposition along flatter areas of the stream corridor. To compound the hazard potential, soils are subject to slipping or slumping during rainy periods when super saturation may occur. Once super saturated with water, denude soils lose their cohesive strength and are subject to sloughing. 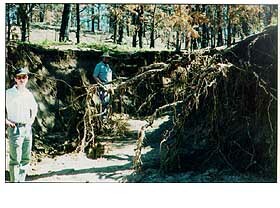 The flooding hazards and increased sediment loading potential associated with barren watersheds was dramatically evident at Buffalo Creek after July 12, 1996. Of the 12,000 acres that were burned, approximately 8,000 acres were burned by high intensity crown fires. The fires burned so hot the ability of the soil to absorb and retain moisture were significantly impacted. A hydrophobic or water repelling soil condition occurred over much of the burn area. The hydrophobic soil conditions, combined with the storm event of July 12 that delivered approximately 2.5 inches of rain in a 2-hour time period resulted in the catastrophic consequences. The devastation that followed the July 12th flood rekindled a healthy respect for the power of fire and the need for more concise pre- and post-event plan development. The Forest Service, in conjunction with Jefferson County and community planners re-evaluated the existing plan and began the development of mitigation measures to take into consideration both short-term and long-term strategies to address threats to public health and safety and future flood damage to public and private property. The essential steps taken in developing the mitigation plan were: (1) Identify the issues and concerns; (2) Develop goals and objectives; (3) Identify critical areas; (4) Develop best management practice (BMP) selection criteria; (5) Evaluate alternatives; (6) Screen and select alternatives; (7) Develop a mitigation plan; (8) Implement the plan; and (9) Operation and maintenance. Woodward-Clyde Consultants, REVEG Environmental Consulting, Inc., Revegetation Exchange, Inc. (REVEX), and Weyerhaeuser Company volunteered the professional services of local staff hydrologists, water resources engineers and environmental planners to assist the US Forest Service, Colorado State Forest Service, and the local community in the development of mitigation techniques. Woodward-Clyde, assisted by REVEG/REVEX and Weyerhaeuser, produced two guidance documents to aid in the restoration and mitigation efforts, "Stream Channel Stabilization Techniques for the Buffalo Creek Reclamation Project" and "Application of Bonded Fiber Matrix at Buffalo Creek". The wide range of conditions (steep slopes, soil differences, hydrophobic conditions, etc.) following the fire/flood required a variety of best management practices. Evaluation criteria for BMP selection included: effectiveness, cost, environmental impacts, acceptability, aesthetics, feasibility and durability. The following BMP's were recommended and/or incorporated into the Buffalo Creek mitigation plan. A madge roto tiller was utilized to break up the soil surface and reduce the impacts of the existing hydrophobic soil conditions. The tiller operated on the contour incorporating surface debris (trees, litter, etc.) allowing for areas of surface water percolation. Tilled strips were installed, at varying intervals depending on the slope steepness. Sediment control practices (silt fence, sediment filed burlap bags, rock and straw bales check dams, log grade stabilization structures, and sediment basins) were proposed for use to reduce the down-slope impacts of sediment and slow water velocities until soil stabilization's measures could be implemented. Aggressive erosion control practices (straw mulch, hydraulic mulch, bonded fiber matrix, erosion control blankets, biotechnical applications, channel modifications and seed mixture) were proposed to provide immediate temporary cover that reduced the erodibility of soils until permanent soil stabilizing vegetation was re-established. It is important to note that the long term solution to soil stabilization in burn areas is perennial vegetation. Seed mixtures composed of native plant materials selected to complement indigenous plants is an appropriate long term strategy. The use of hybrid (sterile) plants meet the short term goal of providing immediate surface protection to help eliminate the potential for excessive erosion. However, many studies have shown that the use of vegetation alone will not provide enough soil protection in the first year following a fire to prevent erosion. For this reason, the use of appropriate erosion and sediment control strategies should be employed to protect critical areas until vegetation is established. The lessons learned from the Buffalo Creek fire/flood dramatically illustrate the need for a comprehensive coordination of federal, state and local governments and community and citizen groups in response to disaster planning and mitigation along the front range of Colorado. Government agencies and environmental firms must step forward to share their knowledge and team resources to ensure that initial investigations to pre-fire planning are accomplished, public awareness and education programs are developed and post fire/flood mitigation plans are available to ensure the public safety and reduce the potential for catastrophic property damage and human suffering. ©2000, 1999, 1998 Land and Water, Inc.